It was strange this week not following a sketch but putting my own design together has taken me hours of thinking again. The backing paper is a decopatch tissue sheet and chosen because of the lacy design and the colours. The image is from a set given to me by my sister and I used my Promarkers to colour it. 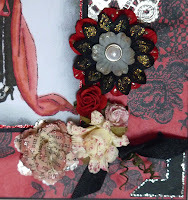 The other embellishments are from my ever growing collection of bits and pieces. I decided to make it for my Mum for Mother's Day. Whilst she was in hospital she was interested in what I have been doing and enjoyed me showing her my creations. I hope she likes this one too. It's quite difficult to get the lighting correct with the silver doyley, but I think it gives the overall effect. 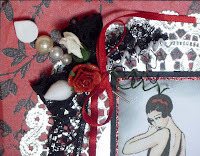 I found the pin in my needlework box and added pearl beads to it and pinned it with a black lace bow. The small text rose I made myself, the other flowers have been put together using shapes from my flower box. Of course I have used my favourite technique of the moment which is adding sparkle round the edges of the mounts and onto the flower petals, I also used Cosmic Shimmer sprays to distress them a bit more. You could not have chosen a better name for your creation. It is pure ELEGANCE, the colours are awesome and the embelishments are absolutely beautiful.You know I love your work and if I were to receive a card like this it would forever have a place on my mantlepiece.Your Mum is one lucky lady. Your card is lovely but to be eligible for the prize from the Anyone for Anya challenge you must use a Greetings Farm image. OMGoodness. This is absolutely stunning! Very, very elegant. Love it!! Wow... what a stunning card! Everything from the colors to the image to the embellishments are just perfect!! Glad you decided to share it with us at Frosted Designs! So beautiful and elegant..wow there are so many wonderful details. Wow, smashing card, really elegant. Love the colour combi and all the embellishments. 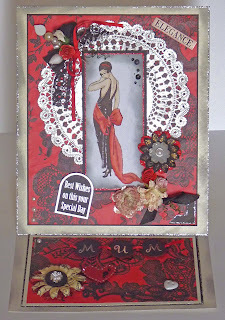 Your easel card is stunning Brenda, such afabulous image and wonderful accents.